may occur are not produced using pictures or patterns. 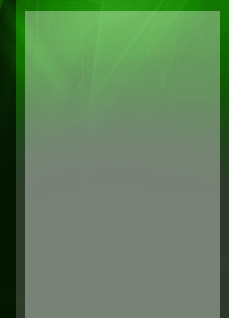 If you are interested in linking to woodakoodashooda.com please contact us at anton@woodakoodashooda.com. 'One who works with his hands is a Laborer. One who works with his hands and head is a Craftsman. "Do not meddle in the affairs of Dragons, for thou art crunchy and taste good with ketchup"
So whats that got to do with the following? Nothing. I just like the quotes. When I was around eight years old on a sunny day in New Boston, New Hampshire my father and I were sitting on the back door stairs and he was whittling out a little horse from a pine branch. After he finished he handed me a piece of pine and suggested that I copy what he did. So I whittled away and with a few suggestions from him I finally produced something that looked like a little horse. More like a dog. I handed him the horse, folded the knife and also handed that back to him. He inspected my work, smiled, handed it back to me and also handed back the knife and said, "Its yours now." That was my first knife. Somewhere along the way it got misplaced along with whittling or treecarving as my swedish relatives called it. I think its kind of funny that in all those years I never heard the phrase scandanavian flat plane carving until 2003. A cousin living in Sweden says its still treecarving over there and that flat plane is an american term. Now ain't that something to wonder about. Then in the late 70's or early 80's a little old man came to my marble and granite shop in San Bruno, California. We talked about stone carving and woodcarving and art on his visits. He turned out to be an artist who displayed at Maxwell's Gallery in San Francisco. 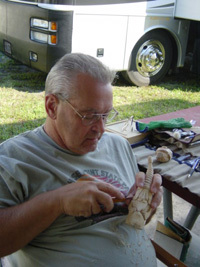 He also turned out to be a famous woodcarver which I, again, found out in 2003 or so. So all that peaked my interest in treecarving and brought back some old memories. My first carving from that point was a turtle on a rock. Its head was a little out of proportion but really not to bad at all. My wife sat on it so I never got to show it to anyone but my sister and she thought it was cool. The turtle that is, not sitting on it. I then saw a Mexican friend with a flat Mirachi Band type hat and carved out a caricature I called Jose. Over a year later my third piece became a fat little elf. I never had any problems with design or layout probably due to my past in architecture and stone and no problems with sharpening or knife strokes. Cut myself though. More than once too. At that point in time I had tried chip carving, caricature, sculpture, any type of carving, carving carving and carving. All using a pattern or book. Patterns were not fun nor very interesting for me and I struggled through them. The carvings turned out okay but in a short amount of time I lost my interest in wood carving. I quit. I thought. So some time 2001 my wife and I were at the North Rim of the Grand Canyon and while cruising down the road in her BBB, bright blue beetle, I saw a small piece of Ponderosa Pine, small being about two feet long, by the side of the road. We pulled over, backed up and and tossed it into the hatchback. Been doing that ever since. Somewhere in Utah a piece I call Woody, cause it unintentionally ended up looking like the Toy Story character, was created using a 6" Bowie knife. Challenging that piece in that way was fun. That started me on using found wood like bark and pine sticks. Junk wood and rejected pieces of wood. Piano legs and stuff nobody else wanted. No books, no patterns, no pictures. Since then I have strived to make each piece I do an original and do not use patterns or pictures. I cannot say that I do not read or see things that influence me because we all do that. There's nothing new under the sun, they say. I suppose someday I'll just run out of ideas or kids and folks asking me to show them how I did this or that, or I'll get the shakes or something or other. At that point in time I guess I'll just frame up my favorite knife and hang it on the wall. Anton Erickson, Tony, AJ, was born in New Boston, New Hampshire and attended The Boston School of Architecture and later, Foundation College for Graphic Arts in San Diego, CA. After over twenty years of architectural practice in New Hampshire, he then moved on to Oregon and then California where he was the founder and owner of a major marble and granite company. Today Mr. Erickson resides in Seneca, SC with his wife of over fifty years, Lucille.